How We Built the Tiki Experience Registration Page – and then drove over 1,300 registrations. | Knak. How We Built the Tiki Experience Registration Page – and then drove over 1,300 registrations. In a past life, I was marketing to security and retail professionals. Although I was doing what I loved to do, marketing, I could never truly relate to my audience. That is one thing I really enjoy about Knak – I get to do marketing for marketers, and share things that I think Marketers would enjoy learning about. This past Marketo Summit we hosted a party with RevEngine Marketing, LeanData and Path to Scale. Jeff from RevEngine had scouted San Francisco for a venue that would be a suitable sequel to the coolest party at the 2016 Marketo Summit in Las Vegas, at the Ice Bar. He emailed me about this Tiki bar called Pagan Idol, and I was immediately sold. Hence, the Tiki Experience was born. We surpassed our ambitious goals for this event, and drove almost 1,400 registrants for the party. We apologize in advance to anyone reading this who was not able to get into the venue. We have made note to find a bigger venue for next year. Given I’m sure a lot of our audience is responsible for driving registrations for events at their company, I wanted to share some of the ingredients that I think helped us reach these numbers and go over what I think makes a best-in-class event registration page. I think with any event, you need to start with, how many people from my target audience are going to be in that city, and looking for something to do. 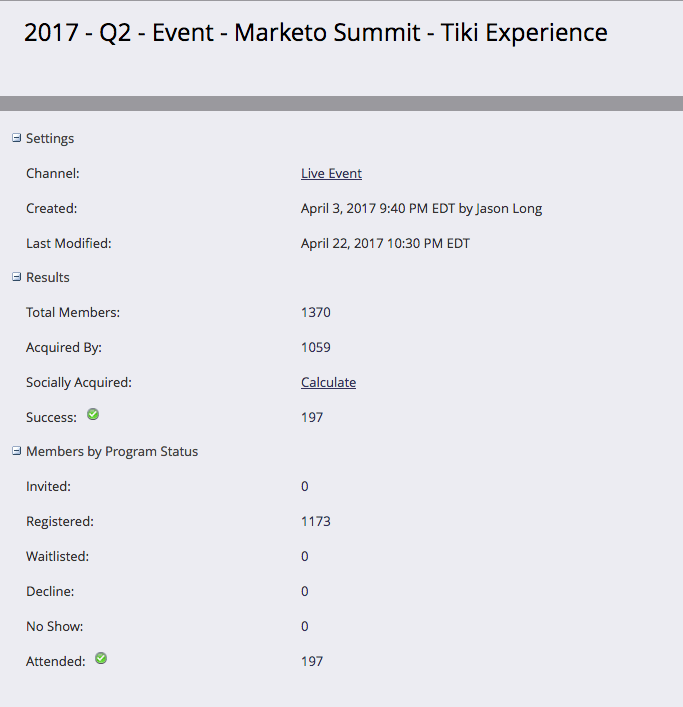 Obviously with the Marketo Summit happening at same time, we had 6,000+ people in SF who could potentially attend the party. That is a good foundation to start with to host an awesome event. We also carefully decided to do a later party, and on a night where we weren’t competing with Marketo’s big event. We figured lots of people would be arriving on Sunday night as well, so figured Monday would be the optimal date. For the past two years, each of our parties has had a theme. First was the ice bar, and this was the tiki experience. I think this makes it memorable and easy for people to talk about. People might forget the name of the bar or sponsor throwing the event, but to make something that people talk about its much easier when there is an easy theme that people can remember. Even if you are the great Corey Worthington of party throwing, it helps to have some help from friends. Our partners were a huge help in driving registrations from their audiences, as well as Marketo, who also helped promote any party that was being held by sponsors who were sponsoring the Summit. This also helps you keep the costs down. Between the 4 sponsors, we likely have most of the Marketo database in our possession. This was huge for driving registrations as we were able to really connect personally with a huge group of people who were going to Summit. It still amazed me how many net new people were added into the database, as people shared the event with the colleagues and friends who were also going to Summit. 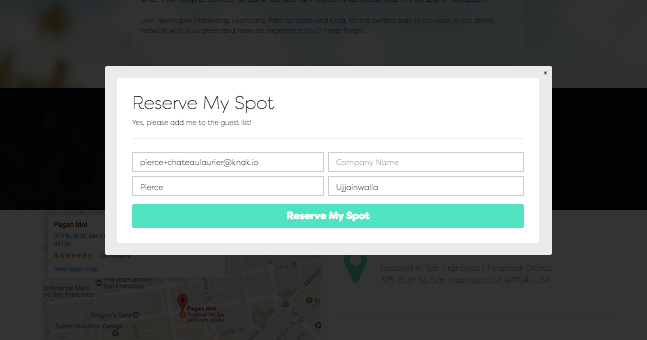 What makes a best-in-class event registration page? All of our pages start here. We identify what the main goal of the page is, and build around this. In this case, it was simple: get as many people to register for the party as possible. Because we had the conversion overlay (which we’ll talk more about later) the secondary goal was to drive people to our homepage to do a trial – in the case that they didn’t register for the party. Design and brand are super important for us at Knak, since that is what we sell, so our designer is involved with all of our big projects like this. 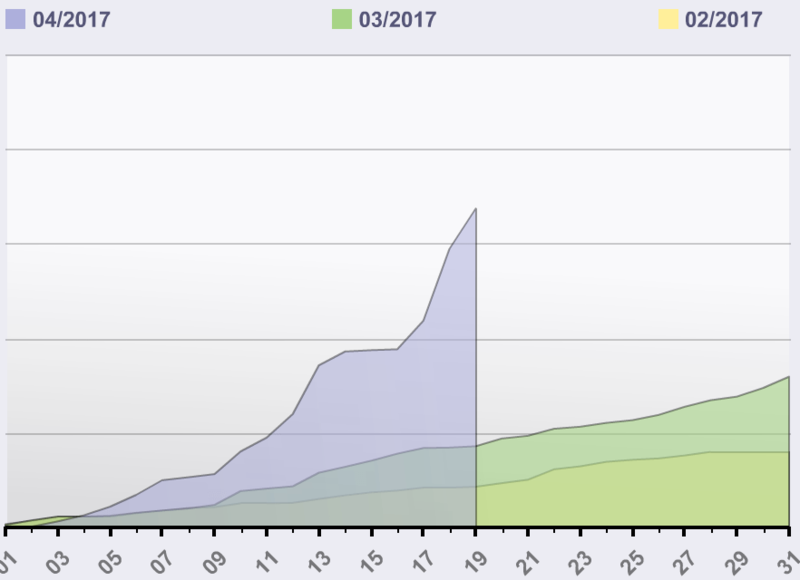 Given that our goal was to drive as many registrations as possible, we wanted lots of opportunities for people to click on the Reserve My Spot. Although most of the traffic when to the main button in in the top left of the page, you can see that there were many clicks on the other buttons as well. There are few psychological triggers more effective than making people feel a sense of urgency to make a decision. The countdown timer not only informs people when the event will be occurring, but that literally every second that they wait to register decreases the time they have to register. This is a very basic thing to setup in Marketo or Eloqua and is made simple the way our templates are built. I know some lead generation purists still like to have forms directly on the pages to reduce friction, but we were able to achieve a 42% conversion rate on this particular page with a lighbox form. Designers love lightbox forms since it does make the page much more visually appealing, and nice hover effects make the buttons enticing to click. The very short form also makes it easy to fill out. We are only asking for 4 pieces of information here. The must haves. 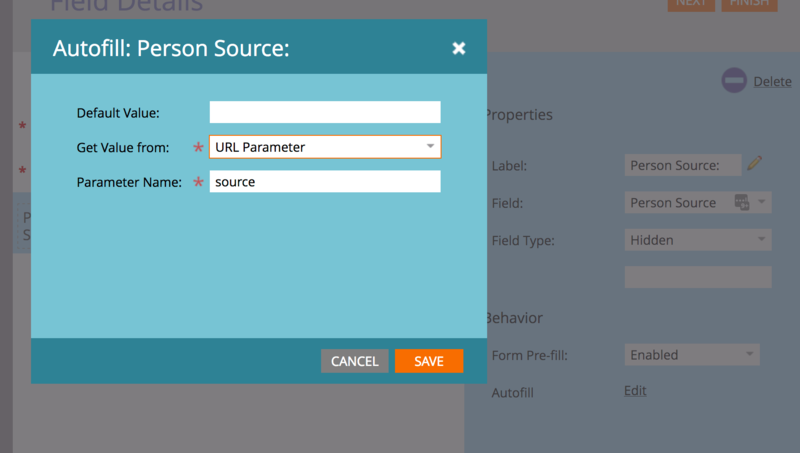 Data augmentation tools like ClearBit, LeadSpace or ReachForce can do the rest.And, of course, since this page lives in Marketo for us, this is a native Marketo form. No APIs or coding or anything required. 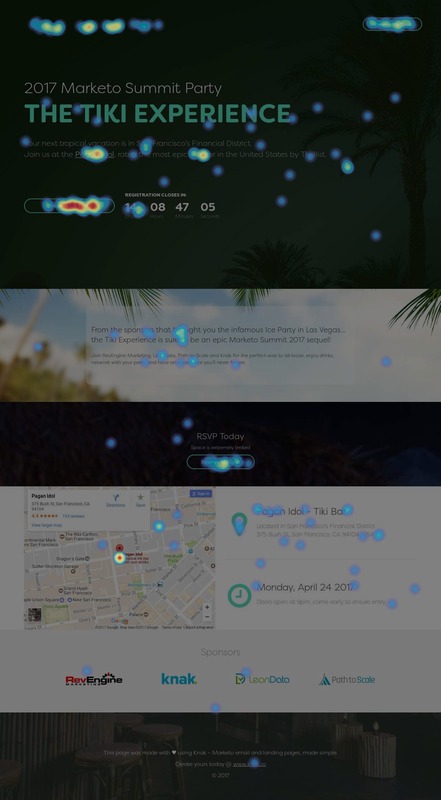 Pretty self-explanatory, but people want to know where the event is and be able to move the map around and interact with it to see where the location is relative to their hotel or the conference. This is also made super easy to do with our page. Again, self-explanatory, but your guests want to know where/when the event is at. Make this a focus point of the page so they can easily find this information. The people who you sponsor the party with need to get their branding in, yo! So this section is specifically made for them. 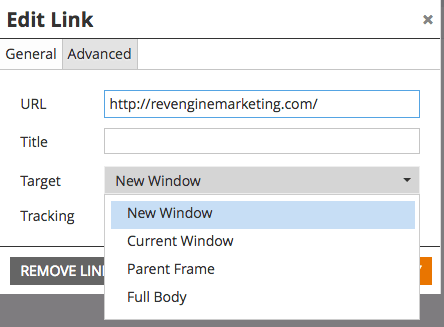 We have it so that you can adjust the number of sponsors in this section using toggle buttons in Marketo. We also link to their pages, opening them in a new window! This is super important because you don’t want to lose that traffic completely. Make sure you use Target = New Window to set this up properly. This is the fancy term for ‘Pop-up’. So, when someone is about to navigate off of the page without registering, we pop-up a modal that asks them to take another call to action. The thinking behind this is that if someone is already going to leave your page because they don’t like the offer they are seeing, why not try and get them with something else. To keep it simple, and not require the creation of a second page, we included the follow-up page directly in the registration page. It’s a seamless experience for the registrant, and its less work for the Marketer. We use HotJar for heatmaps, scroll maps and visitor recording. No amount of testing can show you how real users will utilize your page like HotJar. You’ll get a front row seat to how visitors use your page, how long they read certain sections and any issues that might arise. If you’re not using something like this already, we would highly encourage it. Sometimes it’s the little things that make a big difference. For this particular page, since all of the partners were driving registration to it, I didn’t feel it was fair to have our logo as the Favicon. So, instead we went with the theme and added a Palm Tree as the favicon. Again, like I said at the beginning, this is why I love marketing to marketers. Try talking to a security or retail professional about favicons and you’ll see their eyes just glaze right over immediately. That’s a wrap. The great news for everyone, if you’ve made it this far, congrats, is that this page is available in our template library right now. Even though we literally do this for a living, it took us a good 2 weeks to get this page built. Now, you can have a page like this up and running in a matter of minutes. Hope you learned something from this. Any questions or comments, let me know in the comment box below. Cheers!